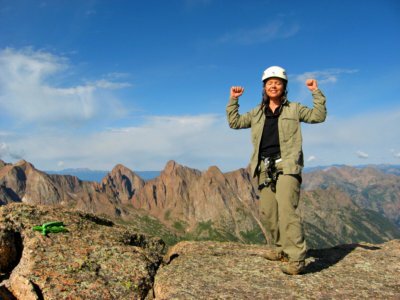 Reaching the Summit of Mount Oklahoma made it our 97th Centennial Peak! 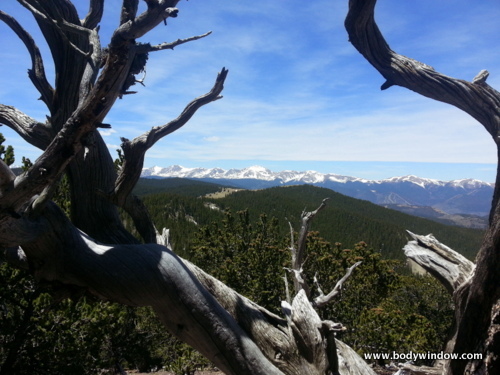 This peak, within easy reach of Denver, CO is a wonderful day climb! 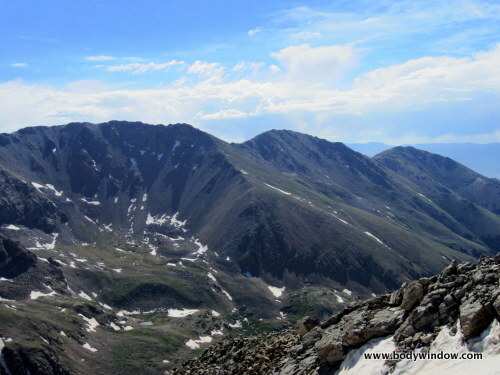 The Centennial Peaks in the Colorado mountains, are the highest 100 peaks in the state. 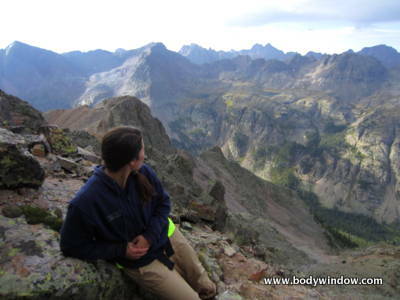 They include the popular fourteeners, and are all above 13,800 feet. Some of these Centennial Peaks are walk-ups, some require technical finishes. This climb, rated a class 2 walk-up was an "easy" climb for us. 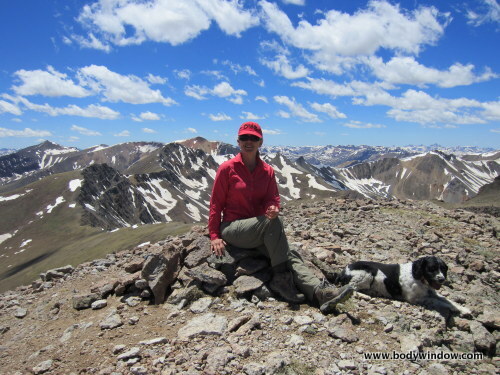 We did our climb up Mount Oklahoma at 13,845 feet, in late June. 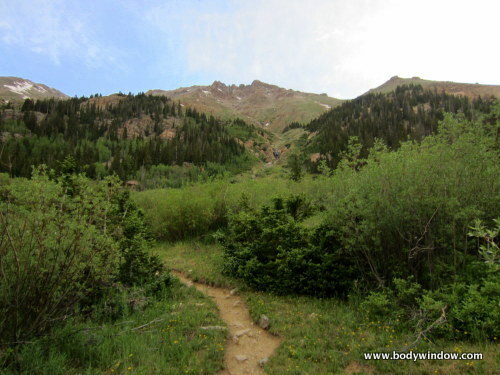 We used the well-known approach to Mount Massive at the North Halfmoon Creek Trailhead. 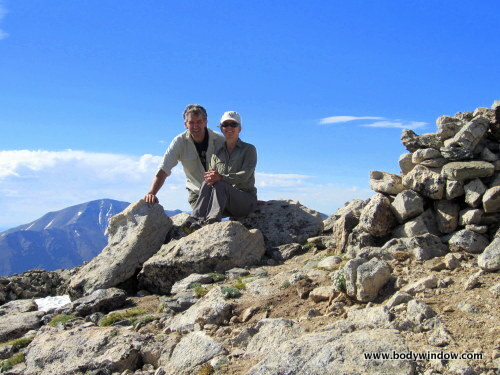 Mount Massive is a fourteener, a very popular Colorado mountain, because it is the 2nd highest peak in the state. 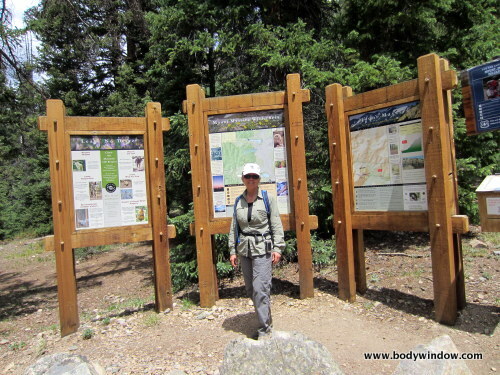 The Gerry Roach guide, Colorado's Thirteeners, describes the way to get to North Halfmoon Creek trailhead from just south of Leadville, Colorado. You must have a four wheel drive, high clearance vehicle to get as far as the trailhead, shown below. If you have a regular vehicle, you can reach trailhead to within one-half mile. 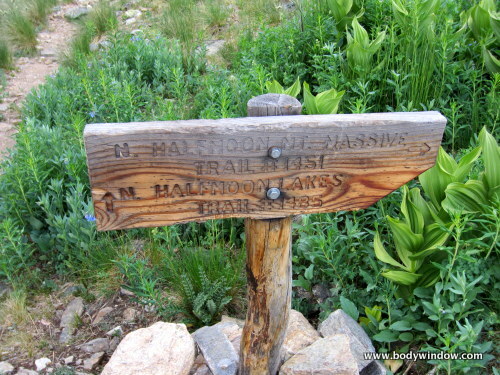 Within a few feet of beginning the North Halfmoon Creek trail, at 10,500 feet you come upon the Mount Massive Wilderness sign. This trail is well-used for two reasons. 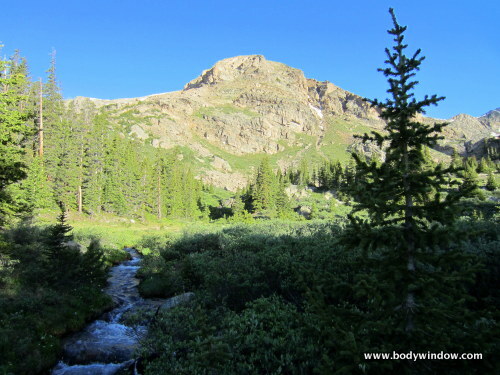 The wilderness area is within a few hours drive of Denver and it provides access to the fourteener, Mount Massive. On weekends, the whole Halfmoon Creek wilderness area is very crowded with peak baggers heading to Mt. Massive and Mt. Elbert. 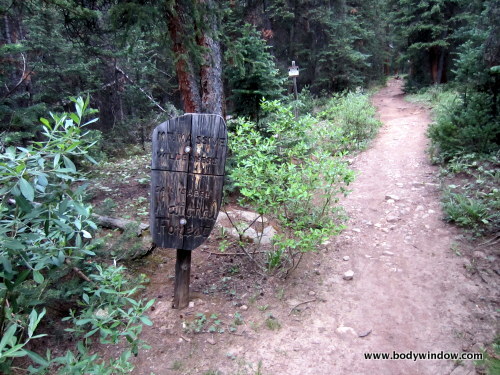 The trail follows along the eastern side of North Halfmoon Creek, always on your left, as you hike northwest. It isn't very long before the views open up and give you a taste of what lies ahead. Our first glimpse of Mount Oklahoma came early in the hike, its broad ridge and summit beckoning to us. Still looks pretty far away, doesn't it? At 1.7 miles you reach the turnoff to the right (east), marked by this sign, below, that directs the way to the summit of Mount Massive. 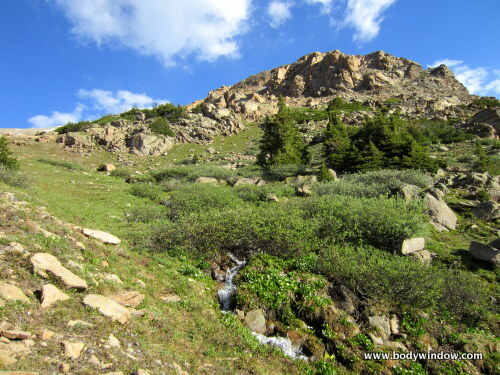 Almost everyone on the North Halfmoon Trail is climbing this fourteener, so if you go straight up instead, toward North Halfmoon Lakes, most likely you will have the mountain to yourself! Prepare for the solitude of the thirteeners! You can also go to the North Halfmoon Lakes for your destination, a most idyllic spot for fishing and relaxing under the grandeur of the Colorado Mountains that surround you. Climbing higher through meadows and pines and over interesting rock outcroppings, you eventually come to this small tributary at about 2.3 miles and 11,600 feet in elevation. Only a few hundred feet after crossing this small tributary, look out for a small cairn that marks where you should leave the comfort of the North Halfmoon Creek trail. Here is where you head west into the trees, looking out for a small ridge that you need to ascend. First cross a branch of the North Halfmoon Creek. It can be quite daunting crossing this stream. You may have to walk up and down the creek, looking for the best place to cross. The biggest mistake you can do is leave the trail too early. Study your USGS quadrangle map or GPS very carefully to ensure that you are at least at 11,600 feet before leaving the trail. 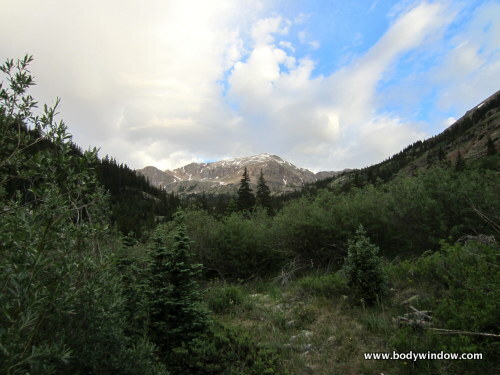 Otherwise you will drop too low in the main North Halfmoon Creek drainage and have an uncomfortable bushwhack. We talked to some other hikers who did this and it was not fun. After ascending the small ridge, often finding goat trails to follow, you come to another opening and another North Halfmoon Creek branch. The views of Mount Oklahoma are wonderful here, and so are the wildflowers! Look ahead carefully, as you need to cross this branch and head up again into the trees and up the ridge, due West. 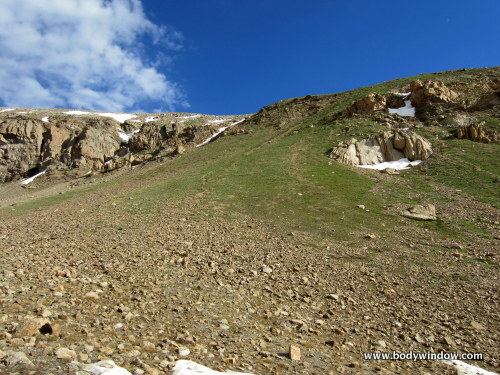 Your ascent follows more goat trails and climbs to the left of the summit, in the picture below, to above treeline, and under the south facing cliff bands. Mount Oklahoma Summit in High Meadow, about 11,700 ft.
As you climb higher toward tree line, your view of Mount Oklahoma keeps opening. You will soon see a shelf (to the right side of the picture below) that allows you to peer back down to the meadow from where you came. 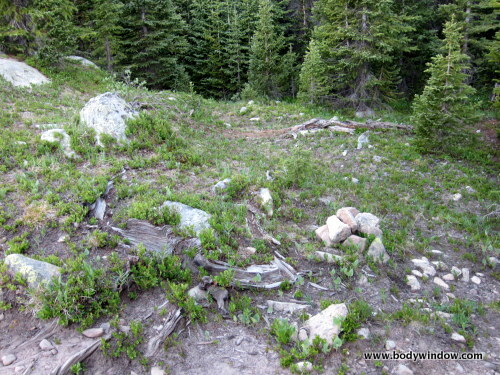 If you keep looking around, you will see the occasional cairn and a faint trail. Keep heading up toward the cliff bands, into a small drainage. 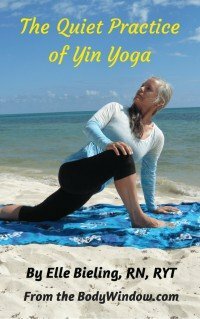 Follow this drainage on your ascension. 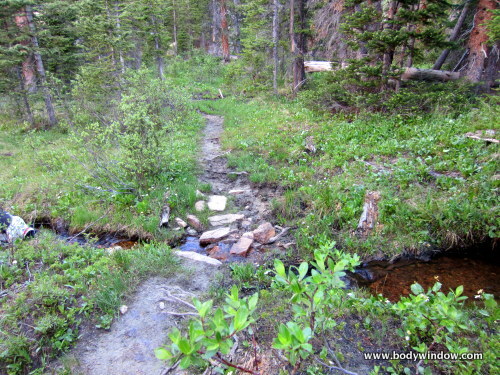 There is a use trail that you may or may not see, right along the small stream. Eventually the drainage leads you to an open basin, under the cliff bands. If you look closely, as you ascend, you can see your path that turns north, up through the cliffs on a grassy slope. There may or not be snow in this basin. We could easily skirt the snow in late June. At the top of the basin, there is a strip of grass on the southern slope. This is your way up to the summit. You can see the use trail, here in this picture. The "trail" consists of green clumps, talus and scree. My GPS said I was at 12,700 feet and at 3.4 miles, when the route turned north up the grassy slope. Once you reach the top of this grassy slope, at about 13,200 feet, the route again turns northwest, through the piles of talus rubble to the summit. There is no trail here, just a cairn here and there. It is best to ignore the many cairns and just pick your way through the rocks however you see fit. We had to skirt some very soft snow where we post-holed, but were able to cross another snow field, that was firmer. You can't loose your way now, if you just keep heading up. 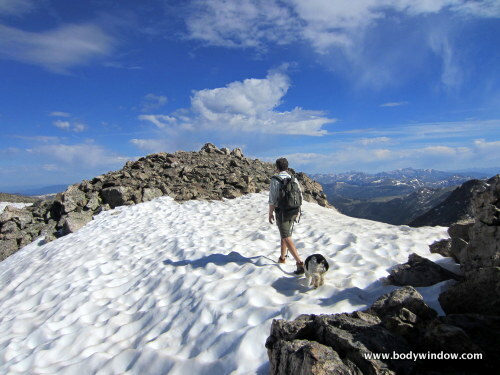 Here is Rich, my husband, and Avie, our dog, doing the final feet to the small summit mound. We arrived after 3 hours of climbing. It was a total elevation gain of 3345 feet, over 3.98 miles. Our mileage was longer than what Gerry Roach recorded in his Colorado's Thirteeners book, at 3 miles. 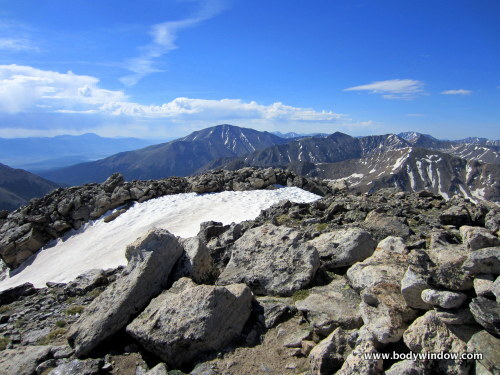 The summit of Mount Oklahoma is under the shadow of some mighty fourteeners. You can see Mount Elbert, the tallest of the Colorado mountains, to our left, above, and the prominent peak in the photo below. It stands at 14,440 feet and is to the south of the Oklahoma summit. Throughout most of this trip, when above treeline, the mighty summit of Mount Massive can be seen to the East. It stands at 14,428 and has 3 summits, as seen below. 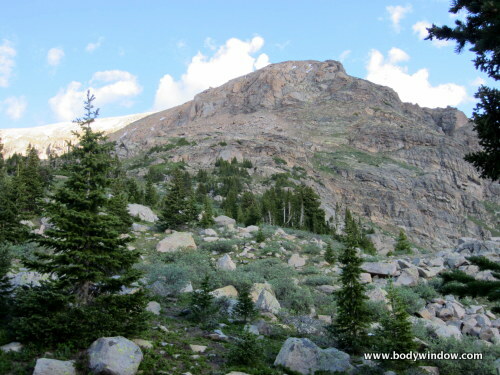 Mount Massive is the second tallest peak in the Colorado mountains. We must have stayed on the summit for over an hour, on this perfect day. We reached the summit long before noon, and the threat of the afternoon thunderstorms. Our descent was vista-filled and easily accomplished in 2.5 hours. As we once again approached the trailhead, it was filled with those who had bagged Mount Massive, making for a crowded return to the car. But it was all worth it, for the solitary thirteener, in the shadow of the mightier peaks. My body-mind-soul was once again filled with the physical accomplishment of the climb, the shared experience with my best friends, and the consciousness of my place in the Universe. The Presence that I always feel among the trees, the flowers, the sky and the peaks, was unparalleled. 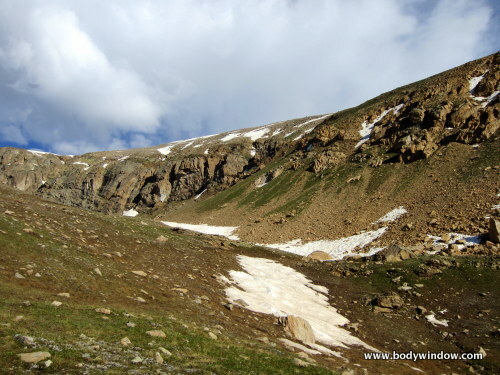 If you are interested in climbing the centennial peaks in the Colorado mountains and need a guide, Gerry Roach's book, Colorado's Thirteeners, is essential. All-in-all it took us 5.5 hours of hiking, for a round trip total mileage of 7.96 miles and an elevation gain/loss of 3345 feet. Like the famous musical, Mount Oklahoma was more than OK!